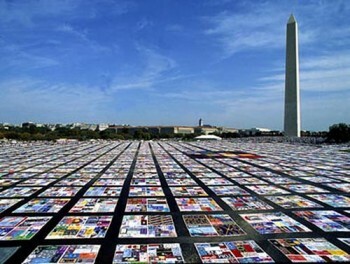 The AIDS Memorial Quilt displayed in Washington, D.C. The display, sponsored by 8th Dimension and the AIDS Service Network, was one of the largest the Philadelphia area has seen in more than 10 years. Haverford College's Office of Community Service, 8th Dimension, and its student-run AIDS Service Network celebrated the 20th anniversary of the NAMES Project AIDS Memorial Quilt by bringing 100 squares of the Quilt to campus, November 30-December 2. The panels were displayed in the Alumni Field House. The names of those memorialized in the Quilt were read by President Stephen Emerson during the opening ceremony and new panels of the Quilt were unveiled during the closing exercises on December 2. 8th Dimension and the AIDS Service Network accepted donations for various local AIDS-related charities during the Quilt's viewing hours. Proceeds will go towards SEAMAC (South Asian Mutual Assistance Coalition) and the AIDS Fund. All area residents were also encouraged to create and present their own panels for the Quilt.“We want as many people as possible to experience the power of the Quilt,” said senior Emma Lo, co-head of the AIDS Service Network. Established in 1987, the NAMES Project Foundation is the international organization serving as the custodian of the AIDS Memorial Quilt, which began with a single 3 x 6 foot panel created in San Francisco. Today, the Quilt is comprised of more than 47,000 individual 3 x 6 foot panels, each one commemorating the life of someone who has died of AIDS. Watch video of the ceremony here.